Elastic band 1×1. All rows knit facial loops sequence: front, Wrong. All purl provyazyvaem on the front face, over wrong Wrong. Elastic 2×2. Number of loops must be a multiple of two plus two edge. All odd rows fit two end, purl two, and odd to meet figure as well as for the elastic 1×1 purl over purl vymazyvaja over facial. 1p. Provyazyvaem to the end of the series 2 facial, 1 seamy. 2p. Throughout the series fit in a report: 1 Wrong, 2 facial. WITH 3 a number of knitting pattern is repeated with 1 a number. An important consideration when you select provyazyvaniya simple gum is the size of the product, So, eg, for large it is possible to take a combination of 4×4, and main circuit pattern, since for the harmonious appearance of the product it is very important, all it combines. Gaining an odd number of loops, then the first row of the report provyazyvaem: 1 nakid, 1 a loop, The withdrawal does not knit, Working thread throws for canvas, 1 front. 2 row. Nakid, 1 loop shot is not knit, two loops provyazyvayutsya as one front. 3 row. 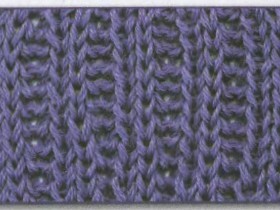 Two loops provyazyvayutsya as one front, nakid, 1 loop spreads not knit. 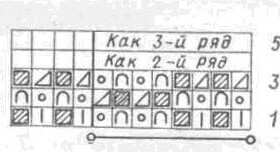 Fabric is knitted in the same way, where the loop without nakida spreads not knit on right needle, a loop with sc, previous row provyazyvayutsya as one front, in this way, steps are repeated until the end of the series. Then it is possible to close the loops product as usual. 1p. front, nakid, not knit loop. 2p. Nakid, not knit loop, Wrong. 3p. Two loops together, not knit loop. 1 row. It fits for ordinary gum successively two end, purl two. The last two loops of a number of facial loops provyazyvayutsya. 2 row. 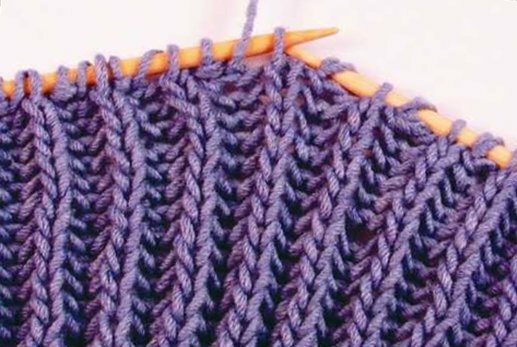 repeat: we do sc, The following retake two loops on the right needle is not knit, two face. At the end of the series is sc and the last two loops shoot not knit. 3 row. 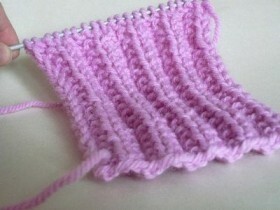 Sc and a loop of the previous row along the front provyazyvaem, 1 front, nakid,two loops do not leave knit. At the end of the series penultimate loop with sc provyazyvaem front and also the last face. 4 row. Knitting for Rapport: nakid, two non-loop knit, provyazyvaetsya next loop with sc front, then again front. Several one end and two non nakida knit loops. 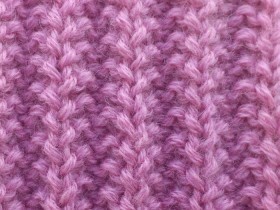 On this same principle, starting from the third row and further knitting continues until the desired size of the web. Set the loops for a double gum must be equal to an even number and divided into four plus the two edge. First row knit follows: front, Knit the front wall,1 loop reshoot not knit, Working yarn before moving web and so on until the end of the row. 2row. 1 Wrong, 1 loop knit is not removed, working thread toss for the product. 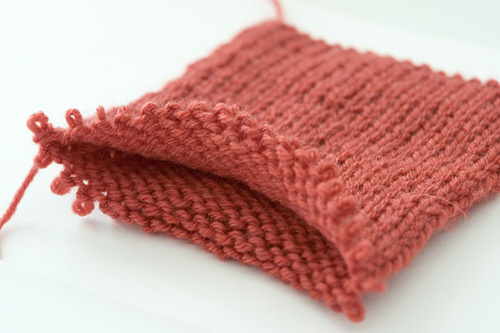 In the third and subsequent rows of knitting is repeated from the first row. Belts and scarves for a double or a hollow gum is best done in a circular knitting, with special spokes. 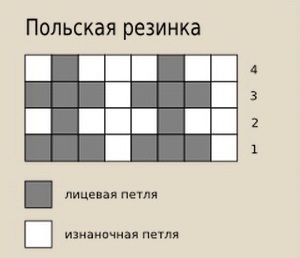 But in this case all the rows provyazyvayutsya the same pattern: front loop, 1 peresnyataya not knit. Number of loops for provyazyvaniya gum must be divisible by 4 and plus 2 edge. All odd rows sequentially provyazyvaem: 2 facial loop, 2 loop seamy, and all odd-numbered rows in the beginning is knitted 1 Wrong, then repeat:2 facial loops and 2 purl, last loop series provyazyvaem front. The second embodiment is taken as the number of loops fold 4 plus the addition to it 2 the edge. All facial series in sequence provyazyvayutsya: 1 front loop, 1 a loop, knit purl, two face. For backstitches series following sequence: 1 Wrong loop, 3 loops facial. 1p. alternatively 2 purl loops and 2 facial for the back wall. 2p. repeat the sequence: 1 Wrong loop, 2 facial for the back wall, 1 Wrong. 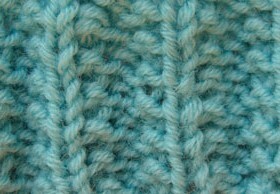 The following rows are knitted over the first. Gaining loop, the number of which must be divisible by three plus 3 loops for wales and symmetry. In all odd rows knit sequentially to penultimate loop: 1 seamy loop, after shooting 1 loop not knit, then provyazyvaem following the rear wall, returning the removed loop on the needle and also provyazyvaem it behind the back wall of the front loop, last loop of a number of purl provyazyvaetsya. Even rows provyazyvaem follows. Knit loop sequence 1 front loop, not retake loop knit, following knit purl, return not knit loop on the left needle and purl it provyazyvaem. Several finish the front loop. Density and drawing gum, must comply with the basic fabric pattern and type of product, for which is gum. Not all types of gum can be used in circular knitting, since many of them have patent, that is, a two-way pattern. it, eg, bands such as French or English 2×2.